Isla Nublar, an island off the cost of Costa Rica, home to the world's last living dinosaurs. In the Main Street of the park, a lone Carnotaurus wandered. Suddenly, a pair of five-foot jaws clamped down on its neck, ending its life. The attacker was Rexy, the island's veteran Tyrannosaurus rex. The theme park of Jurassic World had fallen. With the humans having abandoned the island, the dinosaurs were forced to fend for themselves. Isla Nublar's ecosystem buckled under the variety of different species, with some unfortunate animals being pushed towards extinction. One of these was the Spinosaurus, which was now reduced to a single individual. She had been moved over from Isla Sorna. The Spino wandered through the park's Main Street, coming across Rexy eating the dead Carno. The two apex predators saw each-other and roared. 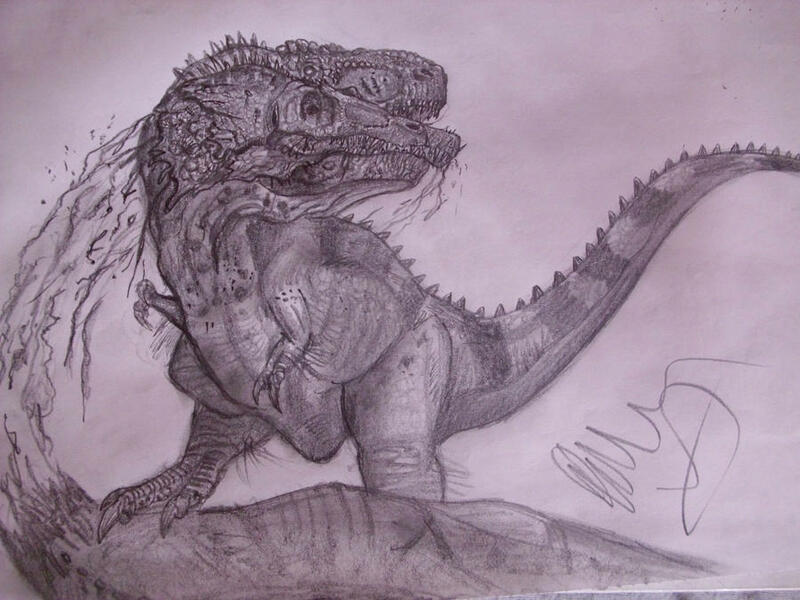 The Rex placed her foot on the body of the Abelisaurid, claiming it as hers. The Spino charged, her mouth open wide. Rexy advanced towards the piscivore, the two locking jaws. For a while, neither was able to gain an advantage, the two animals in a stalemate. Eventually, Rexy, possessing the superior bite force, was able to yank her head back, leaving gnarly gashes on the snout of the Spino, who hissed in pain. The Rex released a mighty bellow, which was met with a swipe of the Spino's claws. The Tyrannosaur shook her head profusely as blood dripped from her face. 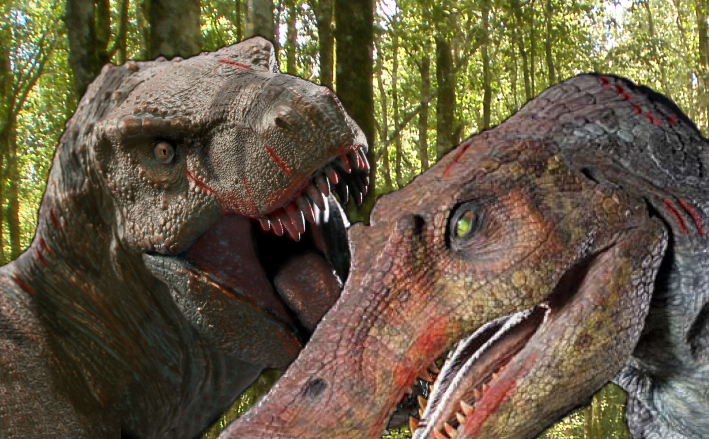 The two theropods circled each-other before Rexy clamped down on the Spinosaur's neck. Twelve-inch teeth punctured her neck as the Spino slashed at Rexy's lower jaw with her claws, only to be shoved into a nearby building. Stepping back, Rexy watched as her opponent staggered forward to face her once more. Thunder roared in the background as rain began to fall from the skies. The T.rex roared at her foe before ramming her massive skull into the chest of the Spinosaurus. 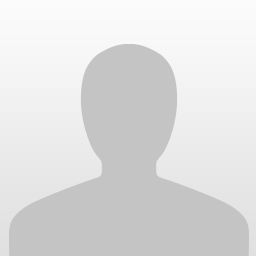 From there, she reached down and sank her teeth into the left leg of the aquatic animal. The Spino growled before sidestepping and clamping down on her neck. Using her long arms, she sliced the Rex's pelvis and face. 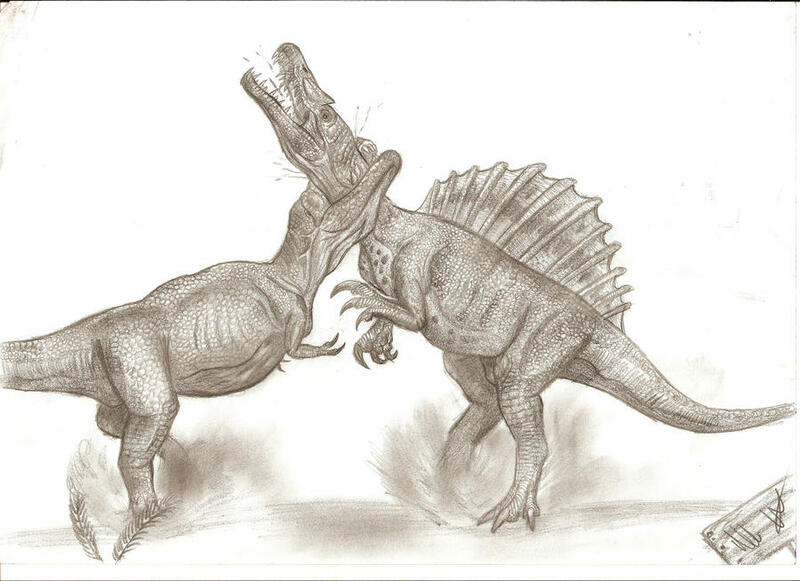 The Tyrannosaur easily slipped out of the Spinosaur's grip and snapped her jaws shut around the piscivore's left arm. 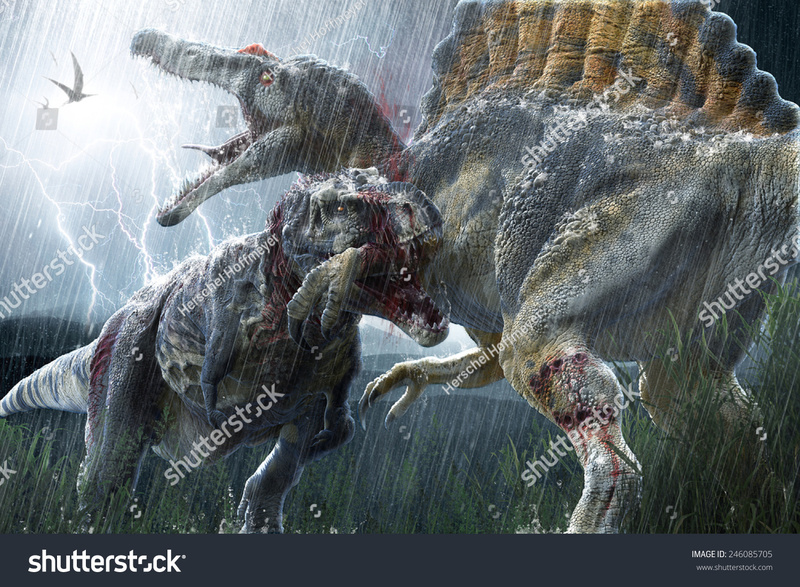 Moaning in pain, the Spino desperately tried to claw at Rexy, only managing to rake her lower jaw. The force of Rexy's bite broke the arm of the Spinosaurus, which fell limp in her iron grip. With her one good arm, the Spino hit the Rex in the face, forcing her to let go. Standing in the rain, lighting crackled in the sky as the two alpha predators bellowed. The Spino went for Rexy's neck, desperately attempting to snap it like she did to the juvenile Rex on Isla Sorna. However, the injury to her arm prevented her from doing so. The Tyrannosaur clamped down on the Spino's skull and threw her to the ground, blood gushing from the piscivore's head. Both carnivores were bloody and beaten down, their heads lowered. However, their instinct pushed them to keep fighting, with Rexy going for the head. She pushed down with her skull before biting down on the Spino's sail. Rexy shattered two of her vertebrae, causing the Spino to squeal in agony. The Spino clambered to her feet, making one last desperate attac. She tried to go for Rexy's neck, but the more-experienced, older fighter stepped back, allowing her to use the last of her energy. 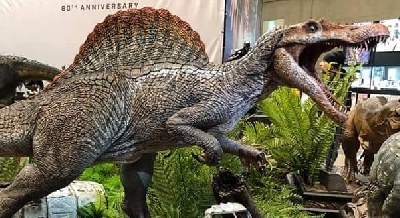 Rexy then grabbed the Spinosaurus by the nec. She slammed the Spino to the ground, pinning it down with her massive foot. Rexy bit down with all she had, her jaws going straight through the Spino's spinal column. The aquatic carnivore stopped struggling. 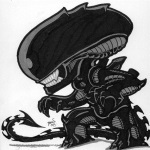 Still, Rexy clamped down on her skull and yanked her neck bac, decapitating her opponent. Placing her foot on the corpse of the Spinosaurus, she roared in triumph. Rexy moved towards the Carno, but collapsed as the storm dragged on. The next morning, various herbivores saw the two theropods. 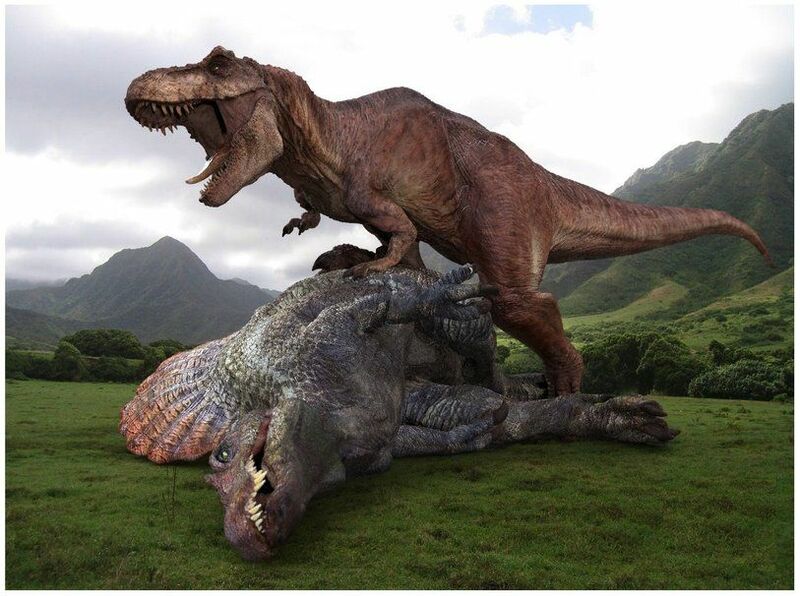 The Spinosaurus was a disturbing sight, but Rexy was still injured, and blood still dripped from a few wounds. A Brachiosaurus passed by, shaken by the mutilated carcass of the Spino. 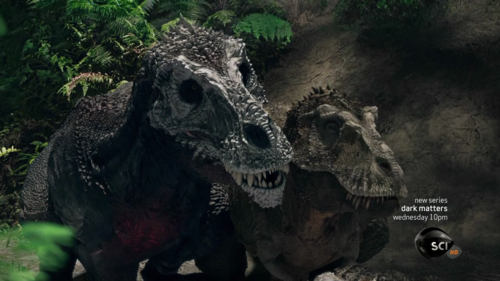 An Allosaurus family dragged away the body of the Carnotaurus since Rexy was still unconscious. Blue, the island's lone Velociraptor, approached the two bodies. She watched Rexy until her eye shot open, prompting her to flee. Shaking her head, the Tyrannosaurus noticed that the Carno was gone--but did not mind, for she had another meal, the Spinosaurus. Divine, godly, every exaggerated vocabulary one could write—this is simply that good. That was pretty good, Tyrannos. A lot better than the fight we got in JP3.